Your divaonthego heads to the Springs next week to report on two hot properties, Colony Palms and Riviera Resort & Spa. Both boast great spas and restaurants I’m told and I’m tasting the fare and sampling the rubs and will report back. 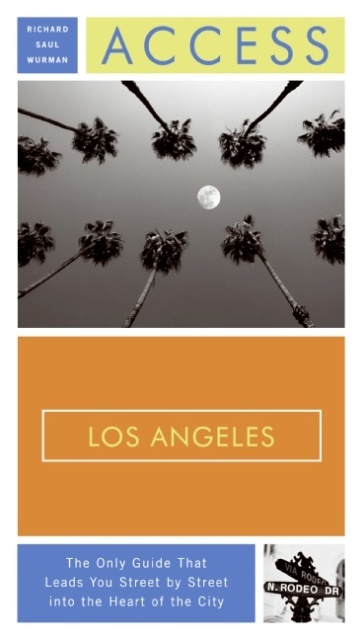 You can also read about Palm Springs and the entire greater Los Angeles metropolitan area in my latest edition of ACCESS Los Angeles, published by Harper Collins. The nifty guide created by Richard Saul Wurman escorts readers from downtown Los Angeles through the burbs and hoods to Orange County, Catalina and beyond. It’s the 13th edition and your divaonthego is the writer/updater of record as she’s been for several past editions. Get a copy at www.harpercollins.com or www.amazon.com. 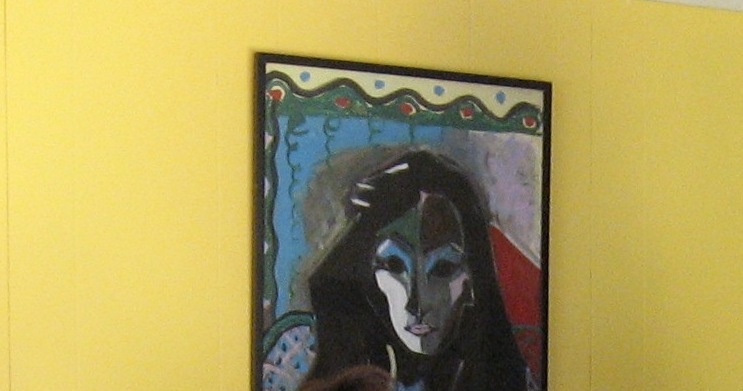 This is an abstract of your divaonthego painted by a wonderful artist Frederic Holley whom I am trying to locate, if anyone knows the whereabouts of Frederic please leave a comment on this blog. Frederic actually invented “vaginal” art, no joke, I have it hanging in my living room. It’s actually quite tasteful. 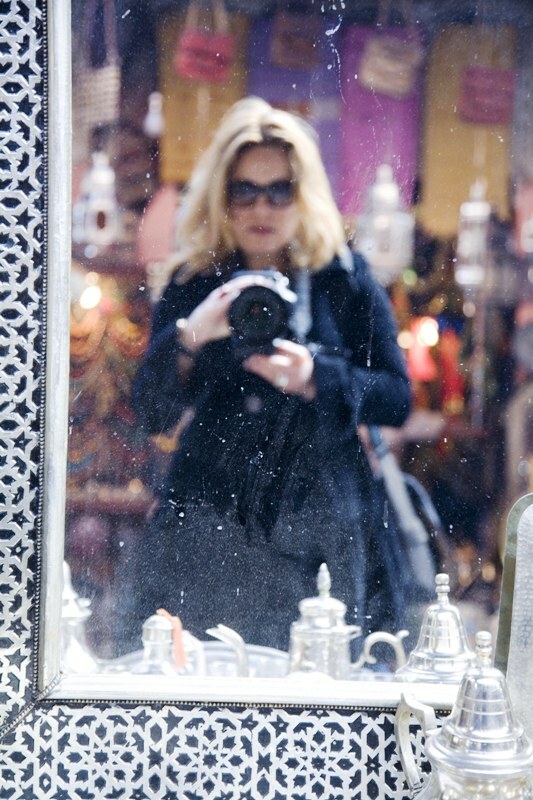 Linda Covello takes a camel ride in Morocco…. A little over-exposed, but cool, shot of Linda Covello…. 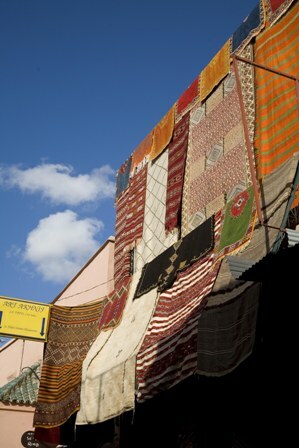 The Divaonthego has been to Marrakech a few times–most via cruise ships. While Octogone Terre was not in my intinerary I did bed down in ultra-posh, wildly opulent La Mamumia–Sir Winston Churchills favorite vacation haunt. I also did the obligatory souck excursions and soaked up the atmosphere as did globetrotting photographer Linda Covello–one of New York’s finest in the field–who provided her take and fotos from her most recent trip. First read the press release, then Linda’s recap. Interesting. We both agree it’s mysterious, bustling, crowded, claustrophobic, dusty with incongrously posh, with incongrously posh, swank hotels and resorts just far enough from the fray providing decadent delights fit for royalty. Marrakech, Morocco (November 11, 2008) — Octogone TERRE Resort & Spa in the stunning Palmeraie Desert knows a thing or two about romance. Named one of “Morocco’s Sexiest Hotels” by ForbesTraveler.com, TERRE provides a luxurious sanctuary complete with exquisitely decorated rooms, impeccable hospitality, a gorgeous pool, creative dining, and a tranquil spa for guests. The management of Octogone TERRE has created a list of the most romantic things to do in Marrakech for honeymooners and couples wanting to experience the spellbinding romance of Marrakech. For couples seeking a romantic getaway that’s different from the usual trip to Hawaii or the Caribbean, Marrakech offers a hypnotic and magical atmosphere straight out of the Arabian Nights. Its fabulous palaces, lush palm groves, wonderful restaurants, tranquil gardens, ancient city walls, and colorful bazaars combine to weave a magical spell that charms and seduces visitors. Amidst such seductive surroundings romance is sure to heat up. • Watch the sunrise or sunset over Marrakech floating in a hot-air balloon for a bird’s-eye view of the city with the snow-capped Atlas Mountains and expansive desert as the backdrop. Don‘t forget the champagne! Visit http://www.octogonehotels.com/newsletter/ for the complete list of the “Top 10 Romantic Things to do in Marrakech.” All activities can be arranged through TERRE Resort & Spa. Octogone TERRE (Earth) Resort & Spa is a secluded luxury five-star getaway located at the doors of the famous palm grove “Palmeraie” just 7 kilometers outside of Marrakech and on the road to Casablanca. Everything at TERRE — from the architecture to the cuisine — is an innovative blend of old and new enabling guests to step into the past and be immersed in true Moroccan style while being pampered with all imaginable present-day luxuries. For reservations, call: (480) 503-8022 or (800) 915-4012 or visit the website: www.octogonehotels.com. • Indulge in a couples hammam spa treatment at TERRE’s Sultry Spa, where the unique octagon-shaped hammam is the only one in Marrakech that allows couples to experience the centuries-old steam bath ritual together. Enjoy a signature Octogone Royal Hammam and Floral Bath ritual where couples unwind in the steam of the hammam, before a relaxing ginger scrub followed by four-hands body massages using essential oils and fresh mint. The treatment is capped off in a bath scented with rose petals while sipping pomegranate and lemon juice cocktails. • Pack a picnic lunch and go on a day excursion to the Atlas Mountains visiting picturesque villages and artisans markets along the way or head towards the sea to explore the coastline of Morocco and the charming beach in Essaouira. • Take a sunset ride through the West Palmeraie desert in a calèche (horse-drawn carriage). TERRE can prepare a pre-dinner cocktail or mint tea and Moroccan cookies to enjoy during the ride. Okay I’m back and you can read all about my experiences at www.thesavvyseafarer.wordpress.com. It was great fun, the Ruby Princess is a knockout and well you just have to read about it. Your divaonthego is heading to Fort Lauderdale to have a first look at the spanking new Ruby Princess, please check out my savvyseafarer post on wordpress for more cruise news. And come back next week for all the details. I’ll be joining fellow journalists and assorted industry folk on a two day cruise to nowhere after a festive christening ceremony. I love these sneak previews and can’t wait to tell you all about it. According to Princess Cruises: Trista and Ryan, one of the best-known romantic duos in recent broadcast history, are the first and only couple from the The Bachelor and Bachelorette franchises who have actually gotten married. The Sutters also recently celebrated the first birthday of their son, Max. Trista and Ryan Sutter met in 2002, when she was America’s first Bachelorette. The Bachelor and The Bachelorette on ABC-TV were the first and are still the most popular reality dating shows in which one man or woman searches for their soul mate out of 25 potential suitors. Over the course of the show, the bachelorette bestows roses on those bachelors she wishes to continue dating. Trista presented Ryan with her final rose and he then proposed on the show’s finale in November 2002. The couple wed on December 6, 2003 in an elaborate television ceremony watched by 26 million viewers, making it one of the most widely viewed episodes in the history of reality TV and one of ABC’s top rated shows of the year. After their highly visible courtship, Trista and Ryan moved to Vail, CO, where they currently reside with their son, Max. In addition to frequent TV interviews and promotional appearances, he is a firefighter and she is a stay-at-home mom and designer for her new diaper bag line, Trista Baby. The 3,070-passenger Ruby Princess includes a dramatic piazza-style atrium featuring small-bite eateries and an ever-changing array of performing street entertainers. Passengers will also enjoy Princess’ other array of dining venues including the signature Sabatini’s Italian trattoria and the Crown Grill steak and seafood restaurant, plus a relaxing oasis just for adults called The Sanctuary. The new cruise ship will also offer the many other innovations that define the Princess experience, including the popular Movies Under the Stars poolside movie screen, Personal Choice Dining featuring traditional or Anytime seating, multiple entertainment venues, a relaxing Asian-style Lotus Spa with fitness center, an extensive children and teen’s center, a wedding chapel and nearly 900 staterooms with private balconies — perfect for enjoying a scenic Caribbean islands cruise. 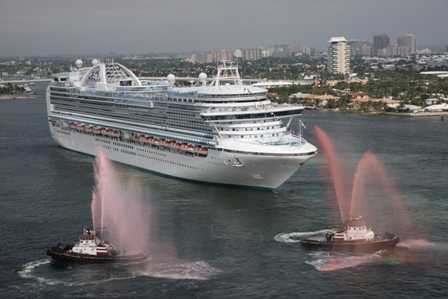 During Ruby Princess’ inaugural season she will make seven-day weekly sailings from Fort Lauderdale, FL to the Western Caribbean. Calls include Ocho Rios, Jamaica; Grand Cayman, Cayman Islands; Cozumel, Mexico and Princess Cays in the Bahamas. Next spring the ship will move to Europe for 12-day sailings in the Mediterranean and Greek Islands. New services: pub lunch, exclusive breakfast for suite passengers, enrichment programs from astronomy to mixology, two new stage shows, expanded wireless Internet and cell phone connectivity. ve christening ceremony. I love these sneak previews and can’t wait to tell you all about it. “The new features aboard Ruby Princess are a perfect example of our commitment to provide passengers with the widest array of intriguing options to customize their cruise vacation,” said Jan Swartz, Princess senior vice president. Wheelhouse Bar Pub Lunch – On sea days, Ruby Princess’ Wheelhouse Bar will be transformed into an authentic English-style pub, serving a selection of traditional fare. A menu of British favorites, including bangers & mash, fish & chips, ploughman’s lunch and cottage pie, will complement a selection of traditional pub brews such as Stella Artois, Bass Ale or Guinness. Pub lunch meal service is free of charge and will run from 11:30 a.m. to 2:30 p.m.
Sabatini’s Breakfast for Suite Passengers – Suite passengers aboard Ruby Princess will have the opportunity to enjoy an exclusive breakfast in Sabatini’s. Beginning with a “Good Morning Mimosa,” the menu features a variety of breakfast favorites, plus specialty items such as brioche French toast with apple & cinnamon compote, yogurt and super granola parfait with raspberry swirl, soft-poached egg over potato & vegetables with hollandaise sauce, and freshly made Belgian waffles. Suite passengers can enjoy this new amenity, along with the restaurant’s dramatic top-of-ship views, from approximately 7:30 to 10:30 a.m.
Artisan Cheeses at Vines – In addition to serving more than 30 wines by the glass and seafood appetizers that have made Vines a passenger favorite, the atrium-area bar on Ruby Princess will now feature a selection of domestic and imported artisan cheeses. Twelve varieties – including unique choices such as boschetto al tartufo bianchetto, reblochon, and cambozola – will be featured each day for a nominal fee. Vines will also host a series of lively events where passengers can meet members of the ship’s staff, and will continue to offer wine flights and parings. New Enrichment Programs – A number of new ScholarShip@Sea enrichment programs debut aboard Ruby Princess to expand passengers’ horizons, whether they aspire to host the perfect party or increase their maritime knowledge. The Art of Entertaining offers passengers the opportunity to learn party-planning tips from lifestyle expert Susie Coelho via a multimedia presentation hosted by the cruise director. Navigation@Sea focuses on the history of navigation as well as the complexities of plotting the route of a modern cruise ship, with a presentation by the ship’s navigator. Mixology@Sea lets passengers channel their inner bartender with a hands-on course taught by the ship’s bar manager. For star gazers, the new Astronomy@Sea program provides passengers with the opportunity to explore the night sky through a telescope on the top deck, with the expert guidance of a ship’s bridge officer. Developed in conjunction with Dr. Thomai Serdari, Professor of Art History and Director of Research Collections for New York University, Art History@Sea: Botticelli to Warhol, The Evolution of Art makes 500 years of art come to life with a special hour-long presentation. Two New Production Shows – Ruby Princess audiences will be able to enjoy two new Princess-produced shows in the ship’s theater. “Broadway Ballroom” presents the music of the ‘Great White Way’ with a ballroom flair, pairing the songs of hit musicals with dance numbers ranging from foxtrot to rumba. The show also features the talents of a costume designer and choreographer from the TV hit “Dancing with the Stars.” Meanwhile, “Once Upon a Dream” uses unique multidimensional cinematic projection to follow a dreamscape unlike anything seen a sea. The audience will accompany a young woman’s journey as she dreams of everything from a tea party in an English garden to singing camels in the desert, and even a trip through a waterfall and brief nightmare before waking to a new day. The Audience Gets in the Act – A variety of new audience-participation events will also debut on the ship, giving passengers a number of ways to seek their 15 minutes of fame. Karaoke fans can go a bit farther with Love Boat Legends, where they are actually transformed into a famous artist of the past. So You Wanna Be A Rock Star? moves beyond pre-recorded Karaoke tunes to give audience members the opportunity to rock out with a live band on stage. Oceans of Talent puts passenger talent center stage – whether they play a musical instrument or want to try out their comedic timing. The Wake Up Show takes Princess’ popular morning show with the cruise director to a new level with an irreverent talk show format, live band, special guests and an opportunity for passengers to join the “studio” audience, as the show is taped in the evening before its broadcast the next morning. A Few Fine Touches – A number of new service touches will be introduced to delight passengers. In the Horizon Court buffet, new waffle stations will offer fresh cooked-to-order waffles at breakfast and throughout lunchtime, and the buffet will also begin serving complimentary lemonade as a beverage choice. In the evening, passengers will find a selection of canapés in several of the ship’s public lounges. Passengers arriving back from shore will be greeted with chilled face cloths, and by the pool, “misting stewards” will offer a quick refreshing spritz with Evian to cool off. Kid Stuff – Young passengers can enjoy a new Wizards Academy, an exclusive presentation from the award-winning California Science Center. This enriching new program lets children explore the connection between science and magic in a fun and participative environment. Kids will also enjoy activities and projects from popular arts and crafts company Klutz, or participate in Yoga for Kids, a healthy and fun course designed specifically for children. Wireless Internet and Cell Phones – Expanding on Princess’ Internet and phone connectivity, Ruby Princess will offer laptop users additional wireless hotspots around the vessel, including staterooms. The ship will also be equipped so that passengers can use their personal cellular phones, if they have international roaming plans, while onboard. Ultimate Ship Tour – A new exclusive opportunity to experience an array of “back of house” areas that are key to a ship’s daily operations, the Ultimate Ship Tour will give passengers the unique opportunity to explore beyond the public areas with visits to the ship’s engine control room, medical center, print shop, laundry, photo lab, funnel, bridge and other spaces. In addition to getting a rare insider’s view of many areas typically seen only by the ship’s crew, participants will receive a variety of themed mementos at many of the stops along the route. Ruby Princess also includes a dramatic piazza-style atrium featuring small-bite eateries and an ever-changing array of performing street entertainers, Princess’ signature adults-only oasis called The Sanctuary, Sabatini’s Italian restaurant, Crown Grill seafood and steak house, “Movies Under the Stars” giant outdoor movie screen, and Hearts and Minds wedding chapel. The ship will feature an inaugural season of Western Caribbean cruises roundtrip from Fort Lauderdale, followed by a program of Mediterranean voyages in summer 2009.